Earlier this week, I wrote here about 18th c. men's linen shirts. But while a good shirt was the mainstay of a man's wardrobe, few men would wear it without an accessory or two to show his own personal style. Much like a modern man choosing his necktie, his 18th c. counterpart took care choosing what went around his neck. If he were a laborer, working tradesman, sailor, or a sporting gentleman, he'd fold a neck handkerchief in half and loosely tie it under his collar, knotted in front. 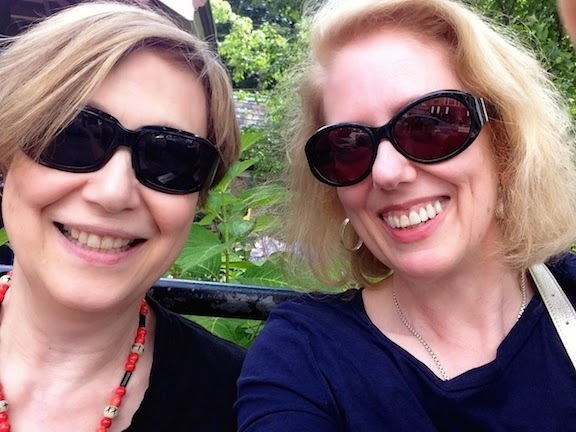 The neck handkerchief was a square cloth of cotton, linen, or silk, depending on the wearer's means, and it could be brightly colored, woven with checks, or printed with a political cartoon. 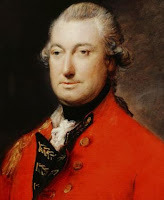 If he had more gentlemanly inclinations, a man wore a neck cloth or cravat, a length of (usually) white linen that wrapped around the throat and tied loosely in front. 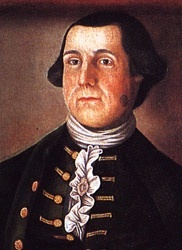 A neck cloth could be worn under or over the shirt collar and band, and trimmings of lace or fringe could make it more distinctive. In most portraits, there's a certain ease to 18th c. neck cloths, a kind of gallant nonchalance in how the ends fall; the perfectly pressed and tied cravats of Beau Brummel are a 19th c. fashion. The most formal neckwear of all was the stock. This was a band of white linen of an even finer quality than the shirt's, carefully pleated horizontally and stitched to fit closely over a shirt's collar and tightly around the neck. (Military officers wore black stocks, like the one on General Cornwallis, above left.) The stock had tabs in the back that buckled together with a pronged metal buckled through worked eyelets. Although it sat on the back of a gentleman's neck, the stock buckle could be an important piece of male jewelry. 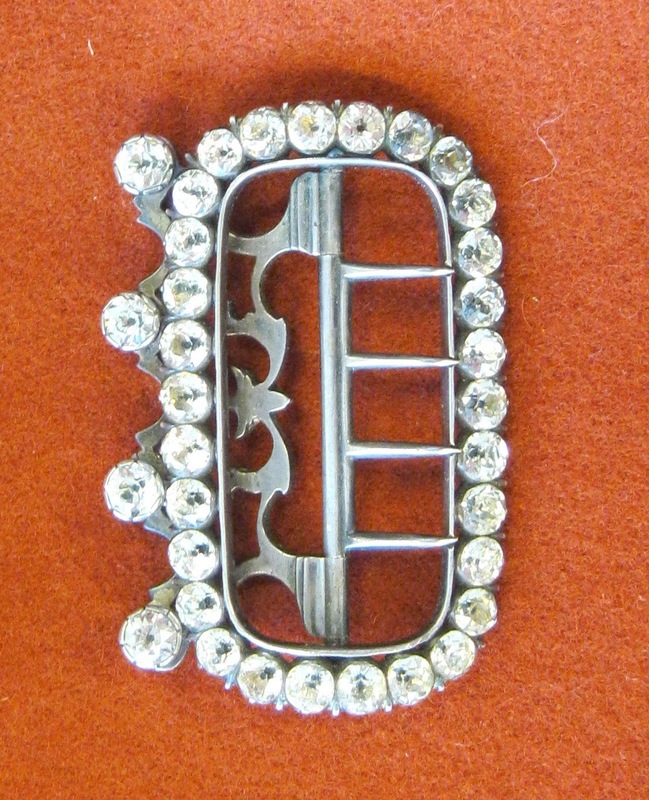 Stock buckles were often made of cut steel, silver, or even gold, and embellished with gemstones or paste jewels, imitation diamonds that glittered in the candlelight, above right. Another kind of buckle also appeared on the front of the shirt. While some men covered the opening in the front of their shirts with the ends of their neck cloths or pinned the sides together with a straight pin, others chose to make more of a statement with a shirt buckle, or brooch, such as the one worn by Judge Devotion, left. 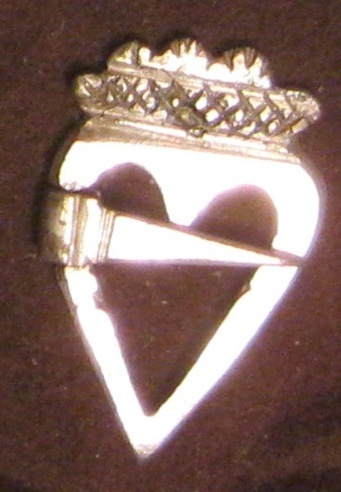 These were often luckenbooth brooches, originally lovers' tokens from Edinburg, Scotland, with heart motifs forming the frame of the buckle, right. 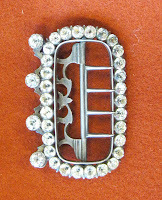 Shirt buckles could be simple, flat designs, or elaborately styled from silver or gold and embellished with paste or gemstones. Of course, no matter the time or place or wearer, every fashion has the potential to become extreme - such as the stunningly tall stock worn by George IV, left. Excellent! Hope that gentleman's knee-breeches will be next in this series? Neck stocks? Shirt buckles? Winding cloths? All makes me thoroughly grateful that I am not an eighteenth century gentleman. Thank you. I always had difficulty trying to figure out the stock and the cravat. Now a question. 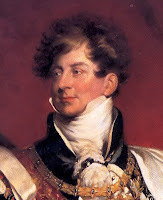 Did all those Regency lords wear a stock as well as a cravat? All I ever read about is the cravat. Whne did the stock disappear from fashion? very interesting post...I never heard of a shirt buckle before. I only knew of the cravat pins that are the modern version of a ladies stick pin. I have a luckenbooth pin similar to that one that's been in my family longer than I can remember. It was my grandfather's grandfathers. It's very simple but that's part of its beauty, I think. I have an antique Luckenbooth my husband gave me when we got engaged. He is a Scot and he says they were often used in place of engagement rings back in the day. I usually wear mine on the lapel of my jacket. Anonymous, we've written about breeches several times before - search "breeches" (the box is in the right-hand column) and you'll get the links. Which, of course, is not to say we won't write about them again. Jane O, I can't offer a definite date for when stocks go out of fashion, since they seem to pop up in portraits well into the 19th c. Any one else with a better answer? In a way, they're still worn today: clerical collars that fasten at the back of the neck are their direct descendants. Rebecca, stick pins and shirt buckles are both ornamental...though the shirt buckles actually did perform a useful service by closing the front of the shirt, while stickpins and tie-tacs are mainly decorative. Nightsmusic and Diane, I agree, antique luckenbooth pins are charming. I can see a post about them in the future! Mounted hunters wear stock ties every day still.